It’s not often that you get visited by a member of the British Royal family. Today, however, we were visited by three. HM The Queen, HRH The Duke of Edinburgh and HRH The Earl of Wessex came to reopen Award House, home of The Duke Of Edinburgh’s International Award. And, apparently for the first time, The Queen and the Duke jointly unveiled two plaques. One for us at the Award and one for our friends at the Royal Commonwealth Society, who are sharing some of our space. “Let me add my words of welcome to those of Mike. Welcome to Award House. You’ve been kind enough to visit us immediately after a major refurbishment of our building – a building that we are able to use thanks to the extraordinary generosity of the Ho family, who own the property. Ma’am, Sir, Dr Ho is unable to be here today, but he and his family send you their very best wishes. “As Mike (Lake, Chief Exec of the RCS) has already mentioned, he and I are already discussing ways in which we might be able to work together – and we both think there are many opportunities to achieve joint impact. 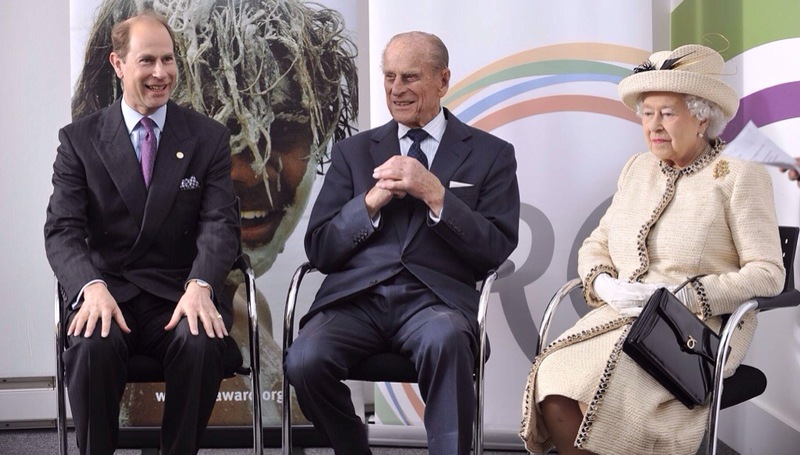 “Mike mentioned that the Royal Commonwealth Society is in good health and so too are we. More than eight million young people have participated in the Award since 1956 and we now have a presence in more than 140 countries and territories. In the last year alone we have seen growth of 12%, meaning that just under a million young people worldwide are doing their Award. “Recently, we have been engaged in a major transformation programme to ensure that we bring the Award to many, many more young people. One of the most important developments is that we’ve begun to make the Award even more accessible than before, by going digital. Some leader training can now be done online. And we are now moving to a new web based Online Record Book for participants. In a moment, Sir, we’re going to invite you to sign off one participant’s Gold Award, digitally. Amanda Lawson is in New Zealand – and is waiting eagerly for you to go online. “Bringing the Award to many more young people, whatever their backgrounds, is arguably now more important than ever. Academic qualifications are important, but what goes on in the classroom should only form half the story for a young person. To be equipped properly for life, young people need to develop the qualities of perseverance, grit, curiosity, optimism and self-control. Economists might describe these qualities as non-cognitive. Psychologists might call them ‘personality traits’. To the rest of us, they’re just known as ‘character’ and the development of character is the business of The Duke of Edinburgh’s International Award. “As I have heard you say before, Sir, one of the challenges of running a charity is that the more successful it gets, the more money it needs to do its work. We rely on the generosity of many, many people to help us grow the Award worldwide. Some of those folks are with us today and I’m delighted to welcome them on this important occasion – and to thank them for their ongoing support. I’m particularly delighted to welcome Margaret Fountain, our global benefactor, after whom we’ve chosen to name the room in which we’re now gathered. And tickled pink we were. Her Majesty and Their Royal Highnesses took time to speak to each member of staff of both organisations. 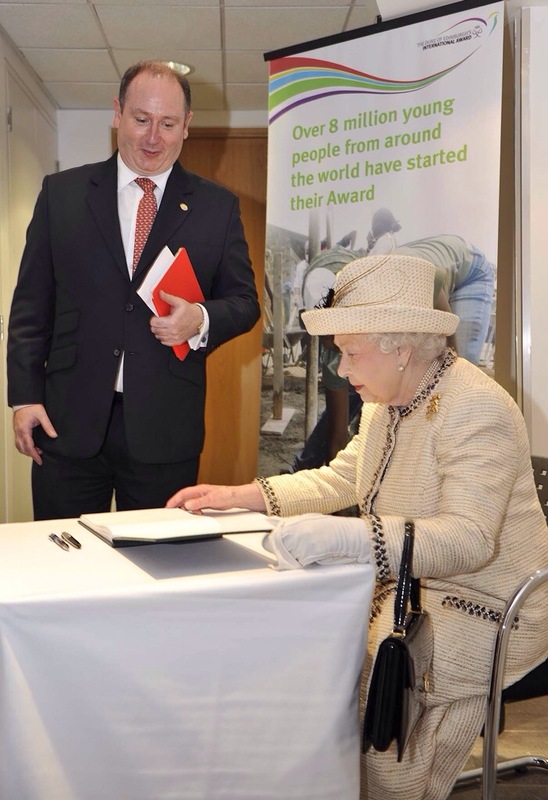 His Royal Highness The Duke of Edinburgh did indeed sign off a Gold Award using our new online record book. And we were able to give Prince Edward his birthday card, signed by the whole team. I see from the photos that I’m thoroughly disheveled. My tie isn’t straight and I have a rather too healthy glow! But I don’t think I’ve grinned quite as much for a very long time. I was, as they say, really chuffed.